Please allow 1- 3cm deviations due to manual measurement. Thanks for your understanding. If you are not fully satisfied with your product, we readily offer a hassle-free 30-Day Money Back Guarantee. The standards shipping time is 7-15 working days by USPS, and the expedited shipping time is 2-5 working days by ups. Unique Elegant Designs: Make your keys more conspicuous, attractive, draw happy attention, and make it easier to find your keys. 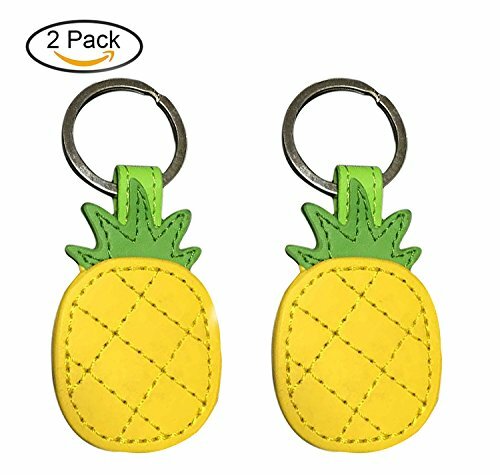 Adorable Keychains:This fashion Pineapple key chain is a great accessory for all kinds of bag and keys, such as cross body bag, purse, backpack, shoulder bag, diaper bag, keys, or some wallet, phone case etc. Make your bags more fashion. Make your keys more conspicuous, attractive, draw happy attention, and make it easier to find your keys. Best Choice: Best gift for Birthday & Christmas & New Year & Children's day & Easter & Halloween & Thanksgiving, and any other occasion to gilrs, kids, womens,daughter and best friends. Material: Alloy, PU Leather. High quality and light, only about 10 grams, convenient for you to carry. If you have any questions about this product by Kaufen buy Kaufen, contact us by completing and submitting the form below. If you are looking for a specif part number, please include it with your message.